After a decade of filming and production in Northern Ireland, HBO’s Game of Thrones is drawing to a close. To commemorate the show’s final season and celebrate Northern Ireland as Game of Thrones territory, Tourism Ireland has launched a new ‘Glass of Thrones’ campaign which will see six freestanding stained-glass windows unveiled across the city of Belfast as the eighth and final season unfolds. The campaign, which was inspired by online fan search data, will feature six windows highlighting a key House from the show, with a series of panels depicting the most talked-about moments from the entire saga. Each window will be large enough for fans to pose in front of, for photos and selfies. 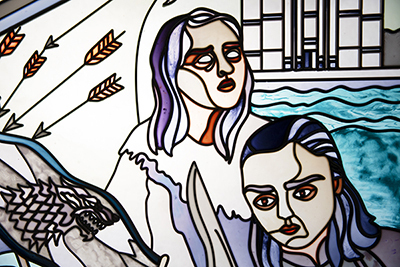 The first window, revealed on 15APR in Belfast, depicts the most searched scenes and storylines of House Stark – whose spiritual home Winterfell is set at Castle Ward in Co Down, Northern Ireland. The window overlooks Belfast City Hall – home to the city’s more traditional stained-glass artworks. An interactive digital version of the Stark window has also been ‘unlocked’ on Ireland.com/glassofthrones, where fans can explore the intricate panels and scenes, upload a photo to create a digital, stained-glass selfie, and then share that photo with friends and fellow fans on their social channels. As season eight unfolds, six giant windows will appear around Belfast, immortalizing the show’s epic battles, dragons, white walkers and red weddings in stained glass, giving fans from all over the world a new Game of Thrones pilgrimage to visit and follow in the city where much of the hit show was filmed. Visit www.Ireland.com/glassofthrones to discover the windows week by week.